This 2016 Ford F-350 Super Duty Platinum FX4 Crew Cab 5 Passenger 4X4 6.8-Foot Medium Box Truck comes with a 156-inch wheelbase, TorqShift 6-speed automatic transmission, electronic transfer case, electronic-locking with 3.55 axle ratio, FX4 4X4 Off-Road Package, heavy service front suspension package, power slide sunroof, all-weather floor mats, remote engine start, heated and cooled leather seats, heated steering wheel, backup camera, chrome side steps, tailgate step, power driver seat, 20-inch wheels with Michelin tires, dual DVD screens, heated rear seats, navigation, locking differential, factory AUX upfitter switches, four 12V DC power outlets, front bumper with 2 tow hooks, clean CarFax vehicle history report, 2 sets of keys, balance of factory warranty, a fresh services, certified to our high standards with a 120 point inspection, and GWVR rating of 11,500 lbs (5,216 kgs). 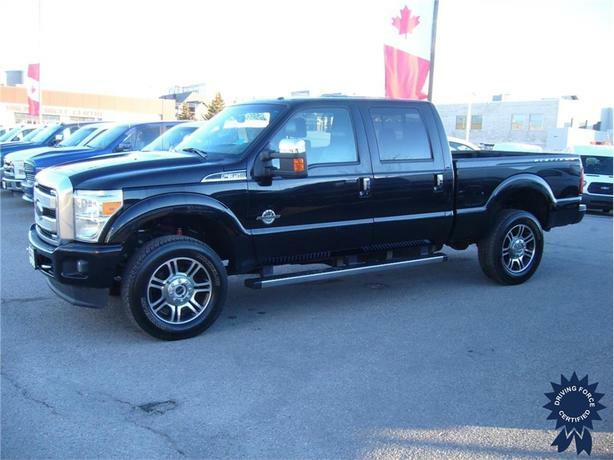 The 6.7-litre Power Stroke Diesel V8 engine provides 440 horsepower at 2,800 RPM and 860 lb-ft of torque at 1,600 RPM. Touch base with us to discuss purchasing or financing options that are right for you and experience the difference you will only find at DRIVING FORCE Vehicle Rentals, Sales and Leasing.